The Solar Mate Secure I is a simple and efficient way to provide movement activated security lighting for your home and garden where mains power either doesn't exist or isn't wanted. Solar Mate Secure's solar panel collects enough energy during the day (even in dull and overcast conditions), which then powers the light at night, when activated by the PIR motion sensor. The light is turned on when it senses movement and stays on for a set period of time (between 30 seconds and 20 minutes) before switching off and resetting itself. • 6 foot connecting cable supplied which joins the light unit to the solar panel. Buying this product will earn 307 Loyalty Points. 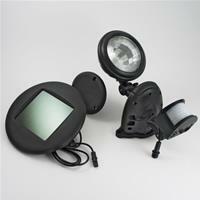 Be the first to submit a review for the Solar Mate Secure 1 Security Lighting.